How do I start a review about a trilogy that I lovingly recommended to all of my reader friends? I profusely claim the Divergent series far surpasses that of the Hunger Games. I was even able to persuade my boyfriend to give it a chance. 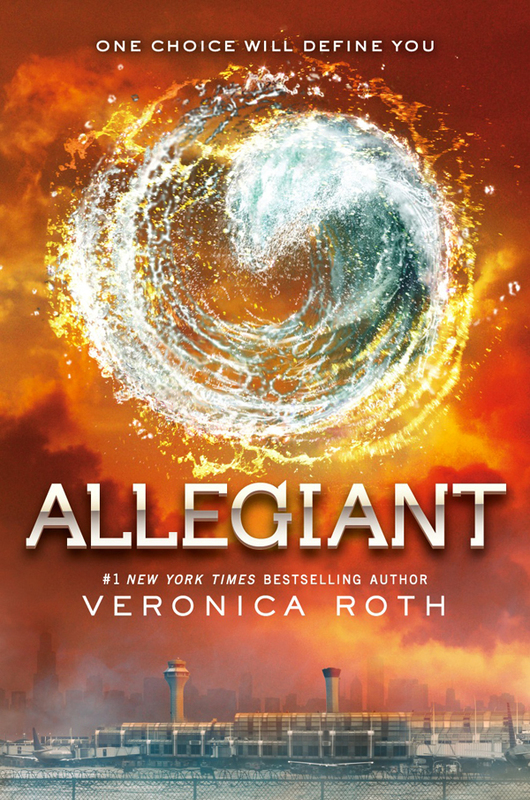 I honestly didn�t get around to rereading Divergent and Insurgent before Allegiant came out. As a result, I had a hard time remembering what happened at the end of the other books. To refresh my memory, I read a few summaries online before starting the first chapter. Insurgent ended with the announcement of life outside the fence. Apparently the factions and everyone in them were setup as an experiment. Tris and the crew start out anxious and ready to escape and find what�s out there. Unfortunately, they must first go on trial for releasing the sealed video of Edith Prior. Each member must undergo the truth serum and reveal whether they knew Marcus� intentions behind unleashing the video. I must apologize as this isn’t as thorough of a review as I had hoped. This book was alright, but I’m finding it difficult to write about. The passion is just not there for me. I’m sorry. From that point on, the book flip flops between drawn out chapters revealing the truth behind the factions, sexual tension between Tris and Tobias, and revolutions. Seriously, I think there are three different revolutions in this novel. Personally, I believe the novel would’ve been much better if Roth focused on one main revolution and developed it throughout. Throwing out too many uprising is confusing and redundant. With that said, I did enjoy Roth�s writing throughout the somewhat repetitive chapters. I was eager to find out what led society to perform such a heinous experiment. My curiosity allowed the pages to flow by in quick succession. If there is one thing Roth is great at, it is world building. Learning about Tobias through his perspective was intriguing, albeit hard to distinguish from Tris� perspective. The other books were all told from Tris� point-of-view and it took some adjusting to get used to have two views. Overall, I think it was a good choice. I was dying to learn more about Tobias and Roth delivered. There was too much yet too little going on throughout the book. Life in the compound felt as if time was moving in slow motion. Details about the outside world and the compound were released in little bits at a time. In between those tidbits, there was a lot of tension between Tris and Tobias. Don’t get me wrong, I definitely welcome the relational tension. It is unrealistic for couples to never fight or have squabbles. I appreciated the fact that Roth included an epilogue. It was interesting to see where the characters were a few years after the incident. Allegiant was a solid book with some flaws. Despite those flaws, I read it all in three days, which is pretty fast for me nowadays. However, I would list this book as my least favorite of the three and I am a bit disappointed by it. That being said, it doesn�t stop me from recommending it and it won�t stop me from going to see the Divergent movie. I don�t understand people who react so strongly. I for one very much enjoyed reading the first two books and they are still listed among my favorites. Overall, Allegiant was a good read. I ate the pages up scrambling to find out how it would all end. I would define it as the weakest of the series, but I will continue to recommend this trilogy to all of my reader friends. View Spoiler » Let�s talk about that ending. Let me be clear about this: I HAVE NO PROBLEM WITH A MAIN CHARACTER DYING. For me, the error was in the way she died. If I�m reading an action filled series and the main character has to die, I want to see it in a badass way. This character�s death just didn�t do it for me. The villain was sanctioned to a chair and she couldn�t figure out a way to maneuver around him? Seriously? I mean she didn�t even try. She made a feeble attempt to talk to him and that was about it. I understand she was weakened from the serum, but this was incredibly disappointing. It left me feeling as if she just gave up without a fight. Actually, back up a second. I still don�t understand why they were going to have Caleb be the one to go through the death serum when they knew Tris was immune to serums from the beginning? Just for revenge? This seemed really out of character from the other books for me. I think it is important for everyone to read and form their own opinions. My best friend read Allegiant and loved it. To each their own! Am I misinterpreting the ending? How do you feel about it? I would love to discuss! I had similar feelings about this book, Cassie. I raced through it because spoilers were flying, but I found the book underwhelming overall. I didn’t feel the connection to the characters that I felt in previous books. I agree with your whole spoiler paragraph. The book was fine but I wanted the series to end with more of a bang. Like you, I’ll definitely see the Divergent movie though and good feelings remain about the first two books. This is a hard book to review, but I enjoyed reading what you had to say. I gave up trying to review it on my own blog! Exactly! I kept seeing tweets about the ending and I wanted to find out what everyone was so mad about. I couldn’t read it fast enough! I completely agree, I loved the characters in the first two books but there was a definite disconnect in the third. Right? I was just like… uh, that’s it? Really? I’m glad! I don’t think it’s fair to condemn a whole series because you weren’t a fan of one entry. It shouldn’t diminish your love for the others! Funny story, I actually wrote this review back in November and never posted it. I didn’t think I did a good enough job and last night I saw it in my documents and posted it anyway haha. Thank you for your comment! It’s nice to be able to talk about it with someone else that shares my opinions! Where you preferred this series to The Hunger Games, it was very much the opposite experience for me. I’m not saying I didn’t enjoy Divergent (because I did), but I had a really hard time caring about most of these characters. Roth certainly excels at world-building and I thought the overall concept was really interesting, but the series as a whole definitely lacked something for me. As far as that ending goes, I have to say, Roth has some serious balls. I admired that ending (generally speaking) and I think she kept true to Tris’ character with the notion of concluding her part of the story in that way, so I applaud her for that. And I agree with you 100%. If you get me crying, that’s a good thing! It means I felt something (even if I didn’t in this particular case). I don’t understand why everyone was all up in arms about the way Roth concluded Allegiant. It isn’t always realistic to give every character a happy ending. Nikki @ Foil the Plot recently posted..TTT: Don’t Take Me There! Oh wow really? I loved the Hunger Games but Mockingjay fell flat for me. I just fell in love with Tobias in the Divergent series! I think that is one of the main reasons I prefer the Divergent series more. I definitely agree. It’s rare to pull a move like that, especially in a Young Adult series. The only thing that I think was out of Tris’ character was that she was going to let Caleb take the serum. I know she was mad at him, but she’s never been that vindictive before. It also was strange because we all knew she could fight off the serums, so she was basically sending him to certain death for no reason. Right? The books that make me cry are always my favorites! I completely agree about it being unrealistic to always have a happy ending. The reaction from fans was really confusing to me. I mean Tris was fighting a revolution in a dystopian world, is it really to that outlandish to think that something might happen to her? I remember people sending Roth death threats over the ending. What did they honestly expect for the ending to a dystopian trilogy? Tobis IS dreamy although it was hard to distinguish his POV from Tris’ in the final book. It was Tris that I mostly had the problem with, overall. And yeah, it def was out of character for her to initially want Caleb to make that sacrifice but I’m glad Roth caught that and had Tris take his place instead. It felt more like HER. And I never really realized that, yeah, why wasn’t Tris’ serum immunity, like, a bigger deal especially after they made such a point of it in the first place? Continuity error, maybe? When it comes to dystopias, it’s pretty much no holds barred. If you want a guaranteed happy ending then read a fairy tale (and not a Grimm brothers one!). I actually prefer it when characters suffer because it makes their subsequent triumphs all that much more meaningful/satisfying. Death threats, I mean, c’mon! I guess it begs the question — are authors beholden to their fans when ending such a beloved series? Or is an author only beholden unto themselves? Definitely a tough question to answer. I agree! I don’t think it’s a good idea for authors to alternate POVs in the middle of a series. It just ends up confusing readers. Although, I understand why she did it. I am very glad she had Tris go back on that decision. If she hadn’t stopped Caleb, I would’ve been really upset. It really bothered me that they didn’t seem to care that she was immune to serums. My brain was just screaming at the characters to wake up and think. Ahh exactly! I totally agree! A triumph is so much more satisfying when you see what the characters went through to get there. With every review of this book, I become less inclined to read it and finish the series. Of course, I’ve spoiled the ending for myself/had it spoiled by people, but still. The complaints seem to be roughly the same, particularly about how the two POVs were basically the same voice. Oh no, I’m sorry you had the ending spoiled! Honestly, that was what pushed me to read it so fast, I was dying to know what everyone was talking about with the ending. Yeah, I mean I understand why she did the different POVs, but I don’t think it’s ever a good idea to switch to multiple POVs in the middle of a series. It just ruins the continuity and makes for a confusing read. If you are ever undecided on a book to read, I would still give it a chance. It was a good book, just not up to par with the others in the series. Oh Allegiant. I’m glad it was ended fairly well, but I didn’t fall in love with this book as much as I had with the first two! There was a lack of connection at some point, which makes me really sad.